We're at C2E2 in Chicago this weekend! And we're doing a live interview with NERDIST's Comic Book Club tonight in Manhattan! 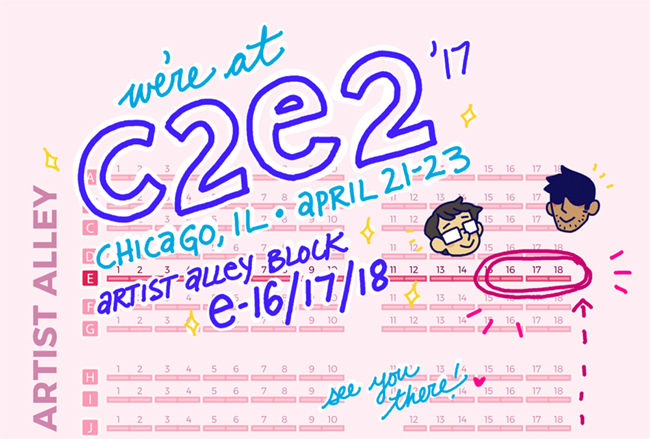 We're at C2E2 this weekend! Come find us in the Artist Alley at E-16/17/18! We'll have books, prints the Barbarous charm and more! Lucky Penny was licensed by Ediciones Babylon in Spain! It was just released, and they also interviewed us for the launch! This is one of the more fun interviews we've done! You can click through and scroll down for the english version. Yuko did art for BARGAIN QUEST, a boardgame being crowdfunded on Kickstarter! Check out her art on the Druid card! And check out the Kickstarter for more details on the board game, which looks really fun!